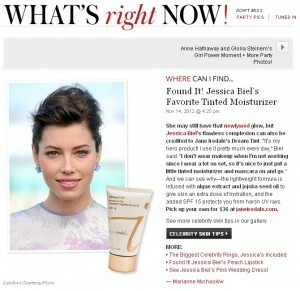 She may still have that newlywed glow, but Jessica Biel’s flawless complexion can also be credited to Jane Iredale’s Dream Tint. “It’s my hero product! I use it pretty much every day,” Biel said. “I don’t wear makeup when I’m not working since I wear a lot on set, so it’s nice to just put a little tinted moisturizer and mascara on and go.” And we can see why – the lightweight formula is infused with algae extract and jojoba seed oil to give your skin an extra dose of hydration, and the added SPF 15 protects you from harsh UV rays. Pick up your own for $36.00. We carry a variety of colors and one of our master estheticians would be happy to help you choose the perfect color for your skin. For a makeup that is light and moisturizing, choose Dream Tint Moisturizer by Jane Iredale Mineral Makeup.